One man struggles to stay alive in a world full of mysterious oriental creatures. In this world, there is no good or bad; it is all about survival. 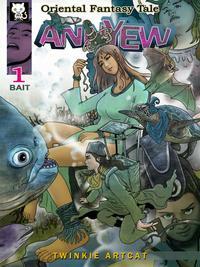 Chosen to be 'bait' by the Queen of the sea-witches, can Annyew survive the giant man-eating fish? And will he be able to get home safely this time? Annyew in an oriental fantasy tale. Book 1 - Bait - Action 1 and 2. A collection of 31 full color comic drawings and others. A total of 42 1024x1365 pixel drawings.